Spring veggies are (mostly) in! Saturday was gorgeous, sunny and in the 50's, and the kids and I got out there and got it done. I have been planting my peas too late and my potatoes too early! So, let's chat about what you can plant in the spring. Mostly, it needs to be things that don't mind the snow, frost, or wet conditions. Some veggies actually prefer cooler weather, as do some flowers. Let's start off with violas, because violas make my heart happy! They are a smaller cousin of the pansy, which also do well in spring weather. They are tough little beauties, and if you're lucky, they'll reseed themselves around. Peas come next, because garden-fresh peas are simply delicious. The last couple of years I have gotten lazy, and it has rained so much, and I've been lazy, that I haven't gotten peas planted until the end of April/beginning of May. Friends, that is too late! Last year I really paid the price, because our summer got really hot, really early. By the end of June, when my peas were supposed to be going strong, they were withered and puny. We got maybe 2 handfuls, total. Not so this year! They are in the ground as we speak! YES! Another thing I learned from Roach's book was to plant peas the quick way, make a shallow trench (about 2" deep), scatter them in it, and replace the dirt. Done! Here I've been poking individual holes all these years. The only tricky thing with carrots is that they need to be kept consistently moist to germinate, and it can take awhile--3 weeks or longer. If you want a continuous harvest, plant another patch every 2-3 weeks through mid-July. Don't be afraid to thin them once they get about as big around as a pencil. Your kids will love the "baby carrots!" Believe it or not, spinach is one of my favorite spring crops. It is so much more versatile than lettuce! Yes, you can eat it for salad, but you can also put it in smoothies, freeze it, add it to soups or casseroles, saute it, etc. Plus, it's so darn good for you! And it's ready to harvest in about 6 weeks! That's practically overnight in gardening terms. Do yourself a favor. Plant some spinach. 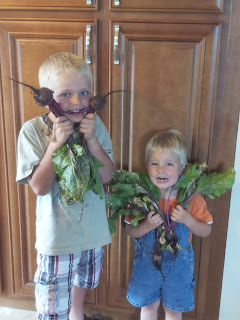 We like beets and we like beet greens. I can't honestly say that we love them, but we're finding more and more recipes we like them in. Roasted beets with goat cheese is pretty yummy. if you want big slicers, give them plenty of room! I'm talking at least 6 inches apart, if not 8. I had given up on growing them, because I was so annoyed with the small ones I would get, until last year. Now I'm back on board! Yay onions! Last but not least, potatoes! So, I learned that you should wait to put these in until 1-2 weeks before your last frost date. I've had 2-3 hills completely rotted out every year, and now I know why. I was planting them too early and they got frozen. I've already bought the seed potatoes, so now I just need to wait awhile. Then I will dig a deep hole and plant one per hole. I did it that way last year and was satisfied with results. It seemed that we got fewer potatoes, but they were bigger. You can also cut them up, with 3-4 good eyes on each piece, and put 4-5 pieces per hole. Are you planting spring veggies this year? Thanks for the tip about the onions. I, too, have been frustrated with itsy bitsy onions. You may have tempted me to give them another shot this year. Where do you get your starts? I bought mine from SYG, but I noticed Ace Hardware had some in last time I went, as well.